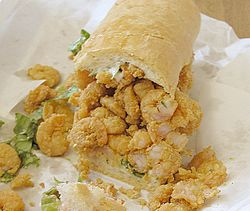 When I first heard of the Po’ Boy as something to eat, I was a freshman at U.C. Berkeley, living in the dorms. Often times during late night studying, a bunch of us would order a pizza as a late night snack. I saw their menu once, with a Po’ Boy sandwich listed at the very bottom of the page. So, I decided to order one. Now I doubt the Po’ Boy I had compares to the traditional Po’ Boy found in Nawlins. 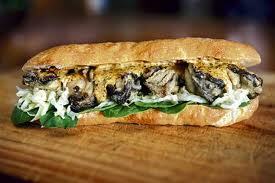 The Nawlins Po’ Boy is the traditional submarine sandwich from Louisiana. It almost always consists of meat, usually roast beef, or fried seafood. It is always served on a baguette-like New Orleans French bread, that must have a crispy crust and a fluffy center. Any local will tell you that the bread is the key ingredient, and what differentiates it from other submarine sandwiches. In fact, that is probably true of most iconic sandwiches. Think of the baguette sandwich, the hamburger, the hot dog, the Reuben, the Big Mac, and the Slider (White Castle). The usual French bread comes in two foot long “sticks”, making a six inch sandwich a half Po’ Boy, and a full loaf of 12 inches making a full Po’ Boy. Most versions in Nawlins are served hot, compared to my first poor cousin of a Po’ Boy in Berkeley. The contents include fried shrimp, fried oysters, soft shell crab, catfish, crawfish, Louisiana hot sausage, fried chicken breast, ham and cheese, roast beef, and french fries. The last two are served with gravy. To dress the Po’ Boy, the locals add lettuce, tomatoes, pickles, mayonnaise, with optional onions, hot sauce, and peppers. Non-seafood Po’ Boys have mustard, in either the hot or regular version, with the hot a coarse grained Creole concoction, and the regular a version of plain old American yellow mustard. 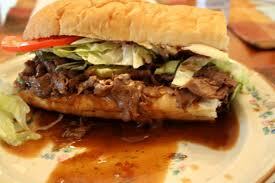 But how did the Po’ Boy really gets its name, other than the obvious story. The popular theory is that two locals, Benny and Clovis Martin, former streetcar conductors, opened a Nawlins eatery in the late 1800s. During a 1929 streetcar strike, the Martin boys fed free sandwiches to the strikers, referred to a poor boys. Needless to say, the sandwiches soon took on the name, and the Nawlins dialect shortened it to Po’ Boy. A typical Po’ Boy sandwich shop also serves local food like seafood platters, red beans and rice, jambalaya, and other assorted Creole dishes. Two that I enjoy the most are Johnnie’s, and Acme. Of course, the bread must come from Leidenheimer Baking Company, founded in 1891 by George Leidenheimer. Many argue about who makes the best Po’ Boy, but few argue about old George’s bread. Obviously, the Po’ Boy or poor boy has extended far past Nawlins, even as far as Berkeley. I rarely see anything like these in Europe or Asia, though the Korean and Vietnamese sandwiches would bear some resemblance, like a long lost cousin. You would think anywhere there is good French bread as being a likely home for a real poor boy. I will be testing the Po’ Boys all over the city. But Johnny’s get first shot. Here I come, right before SB47.